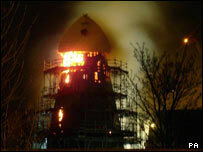 An unexplained fire that badly damaged a windmill in a Kent town is being investigated by police. More than 20 firefighters tackled the blaze which started at the structure in the High Street, Sheerness, at about 2315 GMT on Wednesday. Roads in the surrounding area were closed off and fire crews moved back during the night following fears that the windmill would collapse. A spokeswoman for Kent fire service said the blaze was put out at 0600 GMT. The top floor and roof area of the windmill, which were being turned into flats, are believed to have been almost completely destroyed. A Kent Police spokesman said a forensic investigation team was currently helping fire investigators with their inquires.